A stand for your laptop to level with you. as we become increasingly multi-tasking. A big display, a phone, a tablet... bring them all in your sight. Make a better use of them and spend less time switching back and forth among cluttered windows, apps and devices. Be creative with Desktop Stool’s two front lips that can hold your gadgets, notes, books, etc. See how productive you really are. We all love the mobility of laptop, but it doesn’t mean we have to hunch over it all the time or give up the comfort of a workstation setup. Desktop Stool provides freedom to change postures rather than restrain you into a single posture. It is ergonomically designed to help you become productive and comfortable with your devices. Proudly Awarded by the Japan Ergonomics Society. to help you become productive and comfortable with your devices. 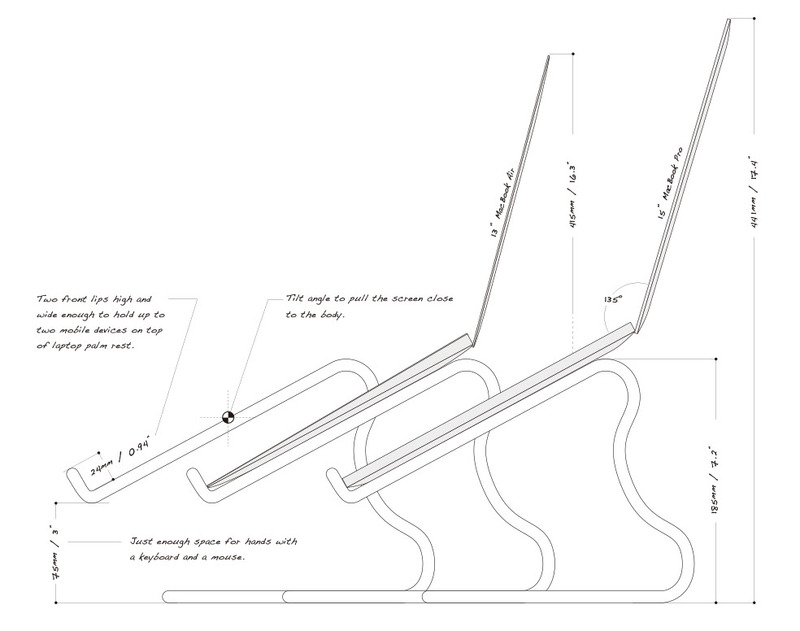 The Anatomy of Desktop Stool. What underlies the curvy form. Ergonomic studies have shown that the preferred posture or workstation setup is heavily influenced by individual behaviors, given tasks and given devices. Desktop Stool is designed for versatility to cater to various working situations of today. Using Desktop Stool with a separate keyboard promotes postural change, which avoids prolonged concentration of stress to specific muscles and joints. Fatigue and discomfort affect your health and productivity. 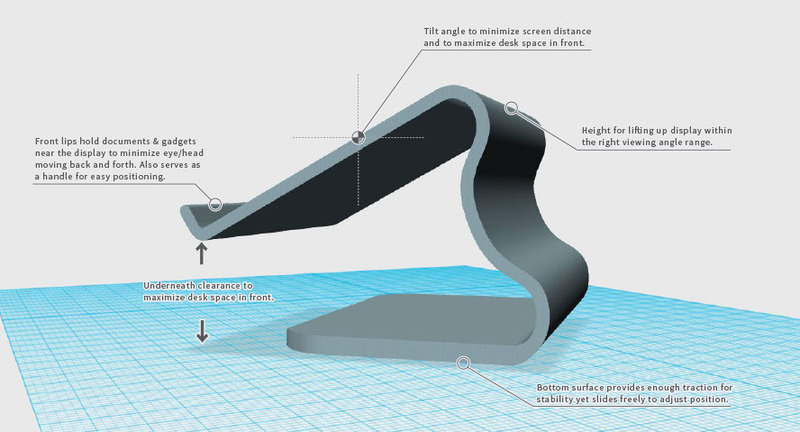 Desktop Stool has two front lips that can hold your gadgets, notes, books, etc. Seeing all your visual targets close together at once reduces eye & head movement as well as the hassle of finding & switching windows. Fits your current and future laptop. Desktop Stool is designed to be versatile. Its neutral design fits most modern laptops in the market regardless of their dimensions. You may or may not update your laptop often, but Desktop Stool may well be your last laptop stand you’ll ever buy. - All Apple laptops of recent years (PowerBook G4 and after). - Screen opening angle needs to be 135° or more. Due to the inconsistent nature of the materials and hand-made process, these specifications may slightly vary for each product. Wood grain is different for each product and may contain some knots.